You can import layer symbology in ArcMap by clicking the Import button on the Symbology tab of the Layer Properties dialog box. Right-click the layer for which you want to import symbology in the ArcMap table of contents and click Properties to open the Layer Properties dialog box. 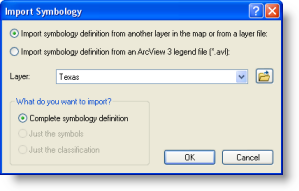 Select an option to import symbology—Import symbology definition from another layer in the map or from a layer file or Import symbology definition from an ArcView 3 legend file(*.avl). Specify from where the symbology is being imported. Choose the layer from the Layer drop-down list to import from another layer on your map or click the Browse button , then navigate to the layer file or legend file from which to import symbols. You cannot apply a group layer .lyr file to another group layer. There is no ability to import. You must add the .lyr file using the Add Data button . Optionally, and if enabled, you can choose to import the complete symbology definition, the symbols only, or the classification only. Click OK to close the Import Symbology dialog box. The imported layer is in an invalid format—occurs when trying to apply a group layer .lyr file to a single layer. The import geometry type does not match the destination geometry type—occurs when trying to apply a layer file from one feature type to a different feature type. You can reuse any type of ArcGIS layer and symbology by copying a layer file, pasting it into your data frame, and changing the data source for the new layer. Also, remember to rename your new layer.